Heat oven to 450°F. Spray 15x10x1-inch pan with cooking spray. In small bowl, mix Italian seasoning, salt and pepper. In large bowl, mix potatoes, carrots, onion and garlic. Sprinkle with oil and half of herb mixture; toss to coat evenly. Place in center of pan. Bake 20 minutes; stir vegetables. Sprinkle remaining herb mixture over pork chops. 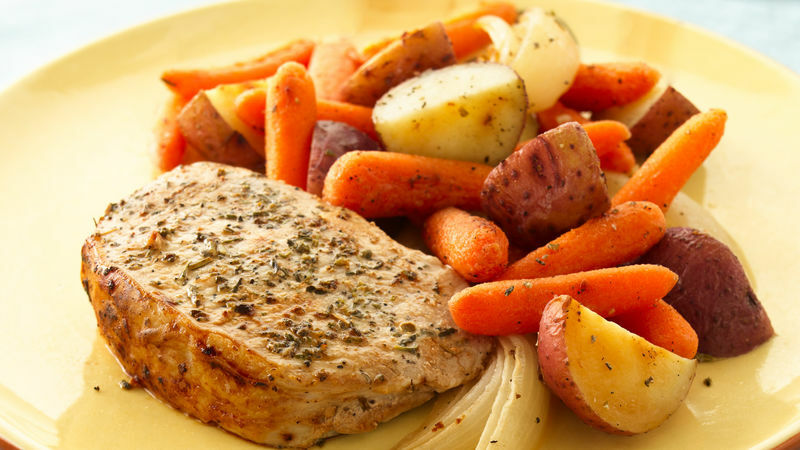 Place pork chops around vegetables. Bake 15 to 20 minutes or until pork is no longer pink and meat thermometer inserted in center reads 160°F, and vegetables are tender.